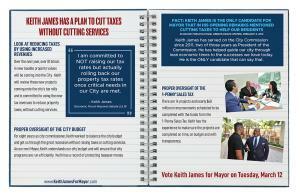 WEST PALM BEACH, FL, UNITED STATES, February 13, 2019 /EINPresswire.com/ -- Keith James1, city commissioner and mayoral candidate of West Palm Beach2 (WPB), today announces his plan to cut taxes without sacrificing essential services through proper oversight of the city budget and using increased revenues from upcoming projects. 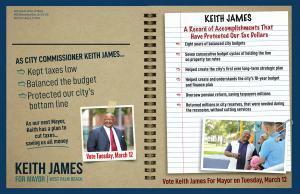 Keith James’ budget experience3 will be important as the city works to manage the funding from the 1-penny sales tax. With 14 projects and nearly $60 million in improvements scheduled to be completed with the funds from the 1-Penny Sales Tax, James will ensure these projects are completed on time, within budget and with complete transparency.